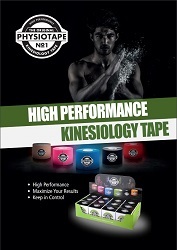 PhysioTape kinesiotape is a high-quality, waterproof, elastic cotton. The anti-allergic acrylic adhesive layer ventilates and is skin friendly. These kind of characteristics make it possible for the tape to be worn for a longer period of time, enabling tissue to recover much quicker after trauma. PhysioTape No1 is registered as a medical aid Class 1 and meets strict quality requirements.